Stick something sweet and stylish on your outgoing mail when you choose these pretty pink address labels. The graceful design features a gentle crest that flows through the design creating an easy-going and attractive appearance. Use these labels to make those forgettable white envelopes pop with a bit of color and personality. Plus, you'll love how this product saves you a ton of time. You'll never scribble out your return address on a piece of mail again. Just peel and place thanks to the self-adhesive backing. 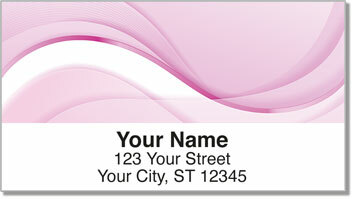 Order your own Pink Wave Address Labels now! We also offer several other colorful options in this same design. And don't forget about the matching personal checks!